Fairfield's candidates for the Board of Educatino at the League of Women Voters Oct. 25, 2017 Candidate Forum. 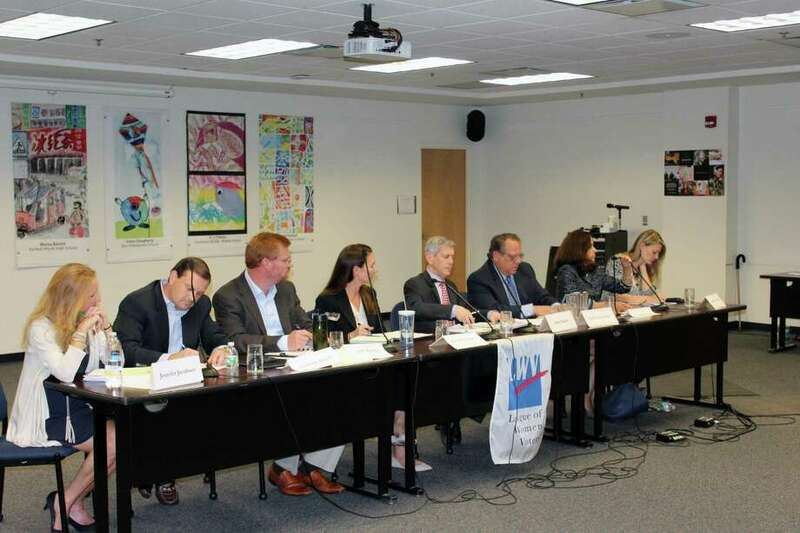 FAIRFIELD — The eight Board of Education candidates met at a League of Women Voters forum Wednesday and money was on the collective brain. Questions about the still-uncertain state budget and how candidates would mitigate the potential losses in local aid that districts like Fairfield may face were dominant. “I think we are going to be handed a difficult budget this year,” Republican Sally Connolly began the debate. Connolly was joined at the Fairfield Public Schools office by fellow Republican candidates Nicholas Aysseh, who is an incumbent, and Jeff Peterson, and Democratic candidates Jennifer Leeper, incumbent Marc Patten, Jennifer Jacobsen, John Convertito and Christine Vitale. The eight candidates are competing for five spots. When asked about possible money-saving measures like school consolidation, cuts to school programs and looking more broadly at structural changes within the district, the candidates mostly fell in line. Candidates were also adamant that any cuts caused by a presumed lack of state funding in the future should not touch school programs enjoyed by students, whenever possible. Leeper suggested that, if funding to the town were cut by the state, the board should look at things like consolidating and lengthening bus routes to save money. The issue of the town’s racial imbalance issue drew more varied responses. Convertito called for a holistic approach to bring about quick change, as opposed to the incremental appraoch the town has taken that he said he ultimately cost more money. Patten said he was in favor of “pocket-redistricting” to help solve the problem. But in dealing with a belt tightened by the state, nearly all candidates called for collaboration between volunteers across boards.